The fight for the podium was as close as it could be with John the Baker edging out Ridgeway by a single point with its dual offering of a classical pizza Napoletana with fresh plum tomatoes, a healthy amount of basil, fresh garlic, and stringy mozzarella, all sprinkled with fine olive oil, as well as a super-traditional half-plain/half-pepperoni pie featuring John the Baker's signature red sauce, both atop hearty, flavorful New York-style crusts. Reaves: "Excellent crust, great ingredients, great cheese." Elliot: "Crust cooked to perfection: crispy but still chewy. Fresh, full plum tomatoes and basil, no prominent cheese texture, but considerable taste." Scott: "Tomatoes give it a phenomenal texture, crust is excellent and tasty, but a bit too thick, got cold pretty quickly too." 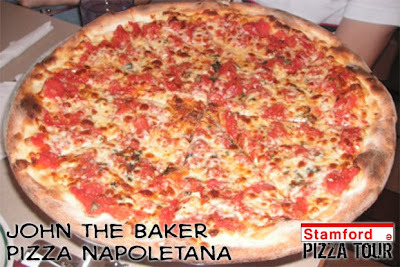 Kait: "Napoletana was the best, good crust, excellent cheese, not too greasy at all." 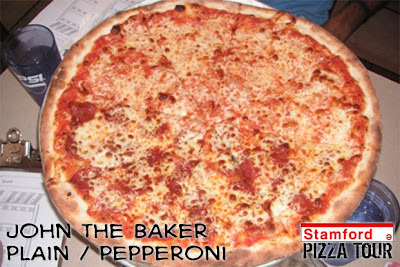 Allison: "Well seasoned, good balance of fresh tomatoes, top notch crust, but the cheese is a little rubbery." 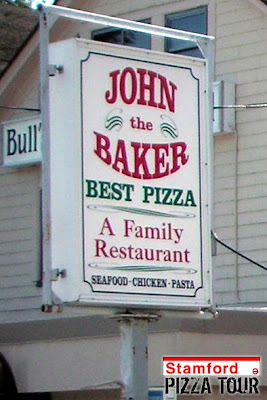 John the Baker is a family staple in Stamford, whether for its pizza, for its vast menu of other Italian specialties, or for its unique ability to throw a helluva pizza party (we all attended quite a few in our younger years). They have been incredibly generous and hospitable to the Tour and to all of their customers alike, proudly touting themselves as a family restaurant first and foremost.